Searching - First & Main OWIE CLUB Bandaged GRAY TABBY CAT "OWIE MEOWIE"
Home→SEARCHING→Searching – First & Main OWIE CLUB Bandaged GRAY TABBY CAT "OWIE MEOWIE"
Searching – First & Main OWIE CLUB Bandaged GRAY TABBY CAT "OWIE MEOWIE"
A couple of Christmases ago our younger daughter, then 5, had a severe bout of gastroenteritis, which involved a couple of trips to the ER. Fortunately she was fine, but she needed a little cheering up after having spent the better part of the holidays either in pain or in the hospital, or both. A Florarma flower & gift store nearby provided the perfect cheerer-upper: a small plush gray tabby cat with a bandage, labeled “Owie Meowie”. It was part of a First and Main collection called “The Owie Club” and featured several other animals in various stages of recovery. She became very fond of it and carried it around constantly – unfortunately, when she started 1st grade, she managed to lose it out of her book bag. Frequent searches of the Lost & Found brought no luck, so we tried the store to see if we could locate a replacement. We ended up contacting every Florarma in a 50-mile radius, and all had several of the Owie Club, but not Meowie. 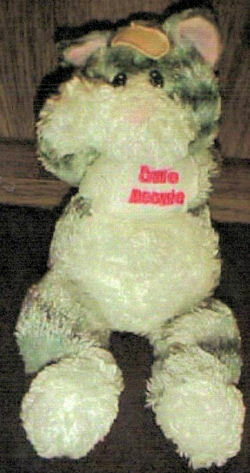 We then hit eBay, and contacted a number of stores who also had the Owie Club collection, minus the little gray cat. We eventually found someone who went so far as to contact their First and Main distributor, who informed them that the Owie Club was still available but for reasons unknown to them Meowie had been dropped from the collection. If you can help Melissa find this First and Main Owie Meowie Bandaged Gray Tabby Cat, THIS SITE IS NO LONGER ACTIVELY MANAGED. Please use Our FREE FACEBOOK GROUP, including #100208-3 in the subject, . Thanks tami, unfortunately we had tried them awhile back and they were the ones who told us that First and Main had stopped shipping Owie Meowie along with the collection, for reasons they didn’t know. We’ll try them again and post the results on this thread. In a Lot. Maybe they would sell seperate? ?